Different websites have different kinds of visitors. Some visitors stay only a short time, others stay longer. There are visitors who tend to view lots of pages, while others read very few. Sites tend to have a profile of visitor with its own character…a bit like characters from classic 80’s video games. First, look at your Analytics and get a sense for what kind of visitors you have. 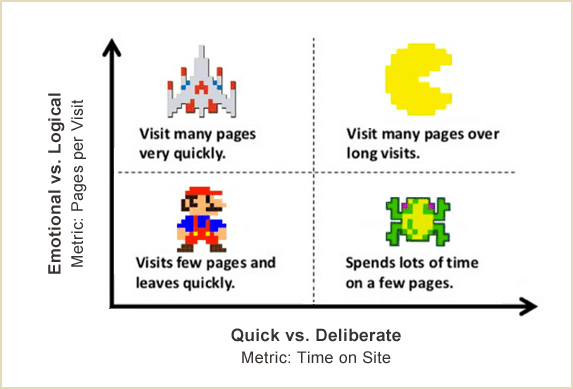 Do your visitors average more than 2.5 pages per visit? Do your visitors spend more than 1:45 on your site on average? Next, use this guide to see what kind of content is most effective. Soon you’ll see how to improve your classic 80’s video game website. Ready Player One! The original Donkey Kong game (1981) was the first appearance of Mario. To this day, Mario mostly does one thing: he jumps around. He has a goal (save Pauline), and he’s in a hurry to do it. These visitors make quick, emotional decisions. Mario visitors will bounce if anything is the least bit difficult. Balance the visual prominence of design elements to make sure that Marios can find what they’re looking for quickly. Mario shoppers like to bounce around looking for deals. They may know what they want and now they’re focused on price. Sometimes, Mario just wants to know when his stuff will arrive. The site that tells him this the soonest will get his order. 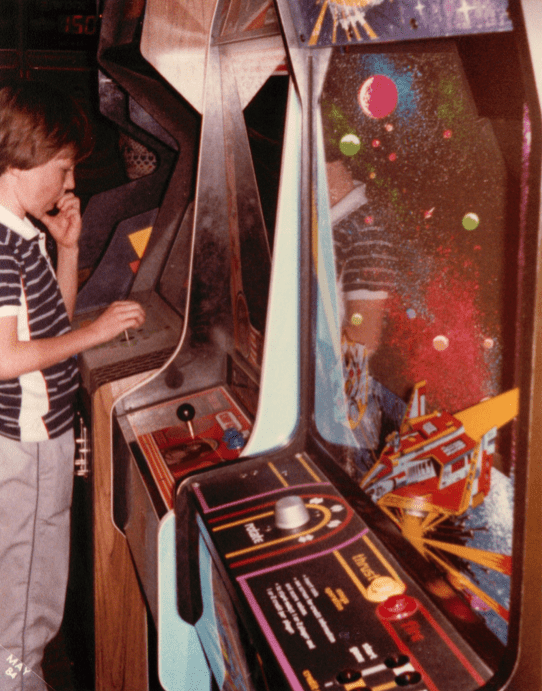 Galaga (1981) was all about clearing levels fast. The faster you blow up the bad guys, the more levels you reach. You know you have have Galaga-type visitors if your Analytics show healthy pageviews but little average time on pages. He’ll cruise through many screens quickly, so you’ll need the right kind of content to catch him. Galaga visitors like the confidence that comes with a trusted brand. Once they’ve decided they’re on the right site, they’ll keep clicking until they find the right page. Be consistent in your branding. If your product or service us used by recognized people or brands, add quotes and logos to the site if possible. Also, Galaga visitors like to see credentials and industry affiliations. Galaga visitors love to read what other people think. This may help slow them down a bit. Older content gets stale fast for these visitors. Make sure that ever date that appears on the site looks current. They’re in a hurry. Give them a shortcut that helps with the decision making process. Frogger (1981) was a goal-oriented but patient little guy. He doesn’t rush out into traffic. He takes his time, waiting to make his move. Go deep into the history and purpose of your business. Even if the information is way down at the bottom of the page, Frogger visitors will eat it up. They need evidence and they’re looking for it. Adding testimonials throughout the site (not on a separate testimonials page) to build trust with Frogger visitors. Association membership logos, BBB credentials, security certificates and awards all help these patient visitors believe in your business. Although visitors frequently don’t know the length of a video before choosing to play it, Frogger visitors are fine with that. They want to hear the voice of the brand and they’ll take time to listen. The goal of Pac-Man (1980) is simple: eat everything. Pac-Man doesn’t miss a single dot. He’s thorough. That’s the point. Even if the information is somewhat technical, Pac-Man will eat it up. Tell these visitors how you do what you do. Go into detail. Don’t be wordy, but be thorough. Stories sell and Pac-Man visitors will take the time to read. Provide a variety of case studies and white papers, showing how you solve various problems. Link from the product or service pages directly to the related case study. Videos or animations will let visitors feel closer to the product or service. Don’t rely on the imagination of Pac-Man visitors. Offer to let them try the actual product or to show them the actual service. Don’t pretend that you’re the only option. Pac-Man is spending just as much time on your competitors’ sites. Acknowledge this and help them consider all the options, right there on your site. Give them decision criteria and show how you offer stacks up. If you don’t understand your visitors, you’re going to need a lot of quarters to be successful. Aligning content with visitors is the key to a successful website. In the end, web marketing should be fun. Try to play it like a game. The better you know who’s playing, the more likely you are to get a high score. Credits: This article is based on a presentation given by Jenny Magic and Brian Massey at Content Marketing World. The original methodology is theirs. I just added some content types and the video game references. Brian’s got a book out called Customer Creation Equation. Check it out! This is Andy Crestodina playing Frogger in 1984. @bmassey Thanks so much, Brian. You’re the inspiration! But I’ll take a look at the book by@TheGrok @JeffreyGroks Brian, if you have any input that would make this more useful to reader, feel free to share. …and for those who haven’t seen it yet, be sure to check out Brian’s book on conversion science. It’s great info, well written. Just a note on average page views and time on site: Use the average of your site, not necessarily the numbers presented here. These can be found in the Overview report on Google Analytics. Andy, from the perspective of a B2B business, is there more advantage of having “Pac Man” visitors over “Mario” visitors? It seems as though the more time they spend and the more places they go, the more invested they are in your business. That being said, is there a way to either: 1. Intentionally attract more Pac Mans or 2. Convert the Marios to Pac Mans? Or is it more “once a Mario always a Mario” in your opinion? @lindseyjodts Brian would say (correctly) that all websites have all kinds of visitors. But if you know that you have lots of Mario or Pac Man-type visitors, this post should help you know what to offer them. It’s very difficult to get Mario visitors to slow down, but not impossible. If you’ve been blogging for a while, look at the average time on page for past blog posts (or even web pages), you may be able to tell which posts are successful at slowing people down. These are likely the more informational “deeper content” posts with how-to content. In my experience, it’s the content that teaches people something or provides a valuable resource that leads to longer visits. I love this post, Andy! Lindsey, I believe that the buyer persona has a lot to do with their buying stage. People in the initial stages of research, who might not even know the proper search terminology, are going to bounce around a lot. They’ll be doing searches that include terms like “what is” and “how do I.” This is where a blog comes in handy! You can answer these questions without getting into a sales pitch. This is a great trust builder. Once they settle in and start discovering the main players in the niche they’re searching, they’ll start digging deeper. They’ll want to see product/service descriptions and research/results. You’ll see terms like “review” and “versus” in your Analytics. These types of landing pages can be part of a blog or part of the main site. Better yet, they’ll be intertwined and used to introduce people to your brand. Once they are ready to make a purchasing decision, they’ll start branching out on a site to look at a company’s history, return policy, service hours, client testimonials, etc. Don’t be afraid to flesh out these pages – many times, these are the last priority when building a site, but they can be the final tipping point to a decision maker. So it’s very important to first discover which pages on your site appeal to which stage of the cycle, and then create a natural funnel that will gain their trust and move them through to the deeper pages. It will likely not happen in one visit, but the more they come back, the more likely they are to be moving down the funnel. Thanks for great post, Rog. I can’t even tell you how much I love that picture of you at the arcade. PRICELESS. Guys just sharing, I’ve found this interesting!